Here's one of our favorite Christmas games for the kids.. spread the Holiday Spirit.. Learn how to "Jingle" your family, friends and the whole neighborhood. It is an easy Christmas tradition to start! Are you familiar with the Halloween GHOSTING or BOOING? If so, Jingling works the same way! All you need to know and do is in the printable Jingling kit below. Let's get started! This fun Christmas game starts with a holiday treat bag.. what should go inside? Candy canes, a homemade Christmas ornament, a ribbon decorated jingle bell or how about some delicious freshly baked Christmas cookies. Here is our best kept family secret for making Easy Christmas cookies with the kids! You can make dozens and dozens of assorted and festive holiday treats in one afternoon, without a big mess and lots of assorted ingredients. Next, tie up your treat bag with festive ribbons and attach this poem. There is a link below where you can print the poem and the JINGLE poster. The idea is to leave the treats at someone's door and put our Elf "You've been Jingled" poster on their door.. showing they have officially been JINGLED. You leave them an additional copy of the poem and poster so that they can in turn spread the spirit and Jingle someone else. It is funny to watch how it spreads through a neighborhood! This kit makes a great addition to a college care package. The whole dorm can be jingled! Here is all you need to start spreading the Holiday spirit... our gift to you - here is our free printable JINGLE kit.. directions, the poem and the ELF You've Been Jingled poster! 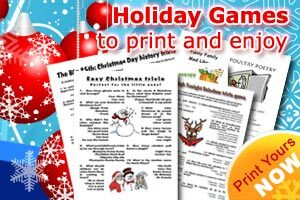 Just print and be on your way to holiday fun. This is such a fun Christmas activity for the whole family! Who doesn't love Christmas music?? Here is a fun holiday game we have played at our own family gatherings.. Name That Christmas Tune... click below to get all you need so that you can play one of our favorite Christmas games! Free printable includes the clues and answer sheet too! We have played this around our Thanksgiving dinner table as a "warm up" to the holiday season! Take a look at another of our fun Christmas activities.. have a card playing group in your family? Play HOLIDAY Hold'Em.. a holiday version of the poker game Texas Hold'em.. no betting in this family version.. just lots of fun.. Free printable playing cards here! Easy to make Christmas Ornament crafts from tealights! More FUN HOLIDAY IDEAS here.... family traditions, games, recipes, creative gift and stocking stuffer ideas!